Each year the Horticulture Program evaluates new varieties of strawberries. We start with bare root plants. We test for cold hardiness, yield, and taste. 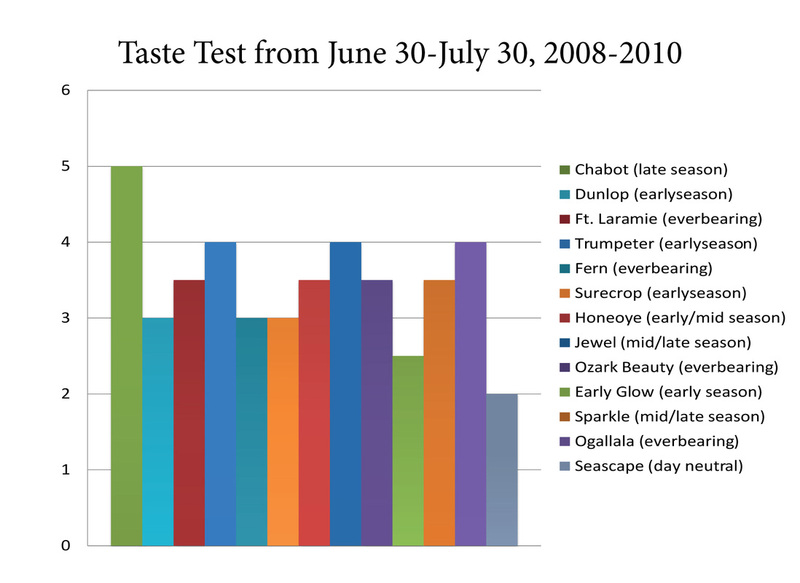 The graphs below show the pounds of fruit harvested per plant and taste test results. 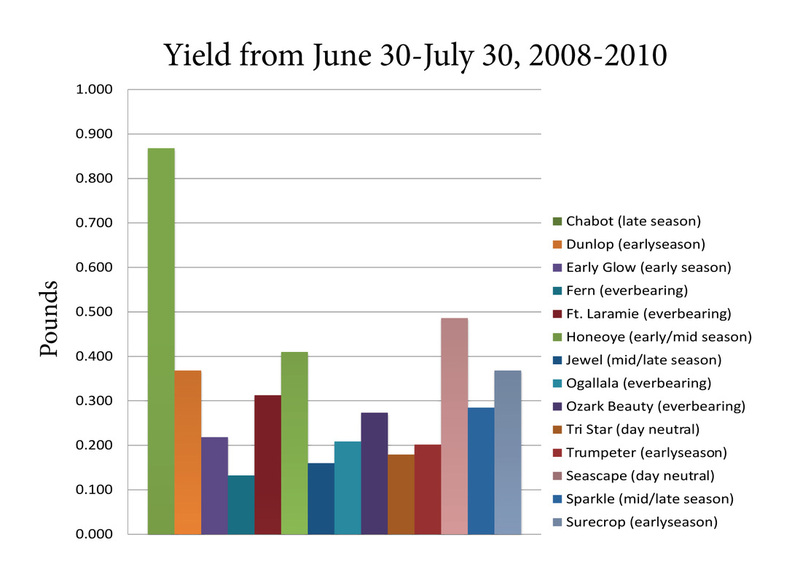 Data is from 2008- 2010. Strawberries are also tested using various raised bed techniques. We tested bed heights, irrigation, and weed control. Raised beds also allow for the use of bird netting and frost cloth to extend the season and expand production. Day neutral, June-bearing, and ever-bearing? 1. June-bearing: Plant produces for two-three weeks throughout June and sends out runners. Expect 0.5 - 1 lbs. in second/third year production. 2. Day neutral: Plant produces throughout the season and sends out a few runners. 0.25-0.75 lbs. in 1st yr. and 0.5- 1.5 lbs. in 2nd and 3rd yr.
3. Everbearing: Plant produces in the Spring, Summer, and Fall and does not send out runners 0.25 - 0.5 lbs. in 2nd and 3rd yr. Results have shown that raised beds, 6” to 24” high, are the easiest in terms of harvesting compared to ground beds. Planting stawberries through weed fabric along with T-tape drip irrigation resulted in minimal weeding; twice a year. For more information, you can contact the Department at 208-496-4581.